It’s important to understand the basics. Credit card processing is a confusing topic to master so if you’re looking for an overview on how the money flows, take a look at this video. In addition, I’ll explain the differences between the two main pricing models: Interchange plus, and tier based pricing. This video is part of a series of understanding the basics of credit card processing. Are you having trouble understanding your merchant account? Are you confused about all the rates and fees and how you’re being charged? If so, this video will explain how it all works. You don’t need to know every little detail about credit card processing, you just need to know enough to delegate the task to a provider that will take care of everything for you. And at the end I’ll give you a couple ideas on how to best select a provider that fits your needs. And finally, the issuing bank will send the cardholder a bill for the purchase. What is interchange and what role does it play? There are hundreds of interchange levels and each is comprised of a set of qualification requirements that must be met in order for a transaction to fall into a certain category. Individual rate categories are set by Visa/Mastercard and the interchange schedule of fees are published (and could potentially change) 2 times per year. This is important to remember since those changes can affect the cost of your merchant account. Here is a sample of just one part of a schedule of fees published by Visa. As you can see, there are 13 rates and 8 categories on this example alone. Again, in any single transaction just one of these rates are charged based on the qualification of the card that was presented. In order to compare these two pricing models let’s first look at how the two pricing structures are related. First off, interchange costs are at the core of both pricing models. The fees for any given transaction are broken down into 2 main categories. Dues and assessments are paid to the card networks (Visa & Mastercard) and are the same for everyone as are interchange costs. They are absolute and every processing company pays the same amount for interchange, dues and assessments. Period. They cannot be changed or discounted for special situations or for any reason so whether you’re a fortune 500 company processing billions of dollars each year or a hobby business with just a couple thousand dollars in volume, you pay the same fees. The processor cost is the one variable that differs from one processor to the next and is the ONLY area open for negotiation in your search for a merchant account provider. You’re choices are tiered pricing or interchange plus. Tiered pricing takes the hundreds of interchange categories and lumps them into bundles or buckets. Each of these tiers are set and assigned a specific rate by the processing company and CAN VARY from one provider to the next. What is considered to be a qualified transaction with provider A might fall into a mid-qualified transaction with provider B. Tier pricing sorts the hundreds of interchange categories and each tier is priced high enough to cover the average of all the rates and fees that fall under that tier. Interchange plus pricing passes the actual interchange cost through to you and a small provider cost is charged in addition. Also referred to as provider markup the fee varies widely based on a variety of factors and can range from .05% to 1.50% or even higher. Referring to the Visa interchange chart we looked at earlier, let’s compare a single transaction at a qualified rate of 1.79% under a tier based program, to an interchange plus pricing model with a processor cost of .20%. The interchange cost is 1.65% + .10 transaction fee. And we’ll use a $100 transaction dollar amount. Given those two variables we know that the actual cost of the transaction is $1.75 ($100 x 1.65% plus $.10). For interchange plus you have a .20% provider cost added to the $1.75 actual cost bringing the total cost of the transaction to $1.95. For the tier based pricing model you have the same base cost of $1.75 but in order to get the total cost for a tier based pricing model you simply $100 x the 1.79% rate assigned to that tier level to get dollar and 79 cent. As you can see, the interchange cost is at the core of each of these pricing models (and ANY pricing model for that matter) and is paid one way or another. So in this example you can see that with the interchange plus pricing your total cost is $1.95 compared to $1.79 with the tier based model. In either example you can see that only a small piece of the total fee is paid to the processor as most of the fee is sent to the issuing bank. Provider costs are collected for the purpose of paying network fees, and other general business costs such as administrative expenses associated with account servicing, application approval and costs related to licensing the electronic payment networks. For each transaction this same calculation is done depending on the pricing model that you are currently paying. It is widely assumed that interchange plus pricing is a better pricing model because it is said to be a “true cost” or a “transparent” pricing model but does NOT necessarily mean that it is a lower overall cost. Variables such as average ticket and the number of transactions processed each month in addition to the pricing structure variables we discussed already determine whether tier or interchange plus is best for your company. Merchant account pricing is NOT one size fits all. In the end, what matters most is the total dollar amount in fees paid for accepting a certain dollar amount of credit card volume. 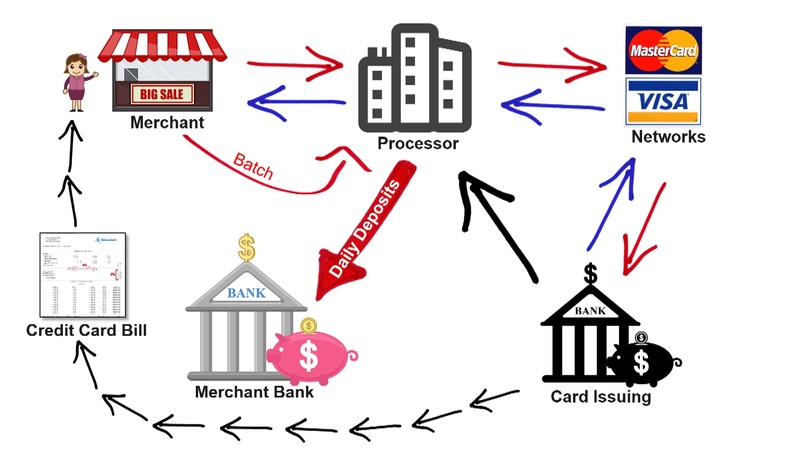 If you’re interested in more tips, advice and ideas on how to best structure your retail or eCommerce merchant account head over to BancardSales.com and look for the Definitive Merchant Account Guide. It’s a comprehensive solution that gives you everything you’ll need to set yourself up with a merchant account that works for you. And remember you don’t need to know everything, just enough to make the right decision.